As the Youth Education Coordinator serving the Wareham Land Trust and the Buzzards Bay Coalition, connecting with local youth is a major goal of my service year. One way I have been achieving that goal is through Wareham CARE, a ‘Beyond School Time’ program that takes place at three local schools. I, along with another education coordinator, visited each school three times for a grand total of nine events and over 10 hours of exploration, engagement, and fun-based education. During these programs, we stray from a traditional lesson plan and introduce students to safe exploration in their local forests and schoolyards. We nudge the students throughout their exploration with hints and tips to encourage further investigation- but we found that the students are mainly driven by their own curiosity to learn about what they discover, whether it be a salamander or a pine cone. These kids were a blast! 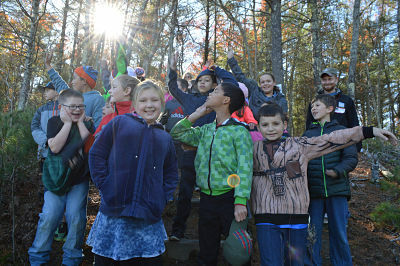 At Decas, the K-2nd grade students explored their schoolyard. Several time, we visited the nearby Horseshoe Mill Property where the students had a chance to get up close to the Weweantic River. It was incredible to see how creative these youngsters were when trying to imagine what animals might use this area. The Minot Forest School is extremely fortunate to have a network of nature trails steps from the school. We spent plenty of time looking for salamanders beneath logs and even running through the rain for a scavenger hunt. These 3-5th grade students didn’t let a little rain stop their exploration. 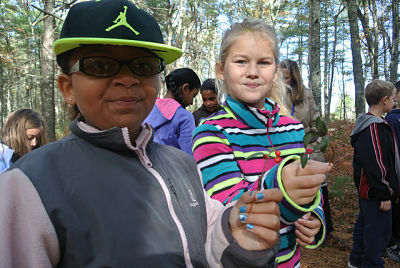 At the Wareham Middle School, students discovered their forest, a pond, and even the salt marsh. These 6th-8th grade students were so inquisitive and were already so knowledgeable about the diversity in their local ecosystems! It is the hope of the Wareham Land Trust and The Buzzards Bay Coalition that these positive experiences of safe exploration in local natural places will instill a sense of respect and appreciation for these resources. With all the smiles and high-fives we received at the end of each program, we can see that we’re on the right track! We are now looking forward to the spring, when we will offer a second round of outdoor exploration programs for all of the 4th graders in Wareham and the CARE program series.